You’ve got to see it to believe it! Come see Fuerza Bruta: Look Up (our review ★★★), a theatrical experience that floods the senses. Experience a 360-degree heart-pounding theatrical event, filled with flying dancers, pumping beats, engaging dream sequences and a multi-dimensional swimming pool above the heads of an audience who is standing on stage in the middle of the action. Enjoy a free open bar for 60 minutes before the show and stay after for a special question-and-answer session with the amazing cast. Please note, the performance is general admission and is 65-minutes long. Event begins at 6:30pm. Show begins at 7:30pm. For reservations, visit www.BroadwayinChicago.com, and use code “THURSDAY” when ordering. Tickets also available by calling 800-775-2000, or visit the Auditorium Theatre box-office or any Broadway in Chicago box-office. Join Oracle for wine and appetizers before the show and a post-show discussion on the direction of Oracle’s 2010-2011 season. Max Truax follows up his Oracle directorial debut – 2008’s stunning conceptual Termen Vox Machina – with an elegant, haunting interpretation of Strindberg’s classic chamber play. This mesmerizing and complex narrative portrays a world where two families are imprisoned in their legacy of greed, duplicity and manipulation. Truax’s vision highlights the play’s depiction of the destructive force of truth. There are things in life much more frightening than death. So you wanna be a producer? 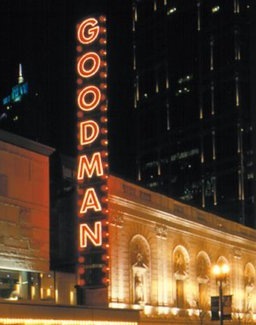 Mark the weekend of March 19 – 21 and plan on attending the Chicago Producing Intensive Conference at the Goodman Theatre’s Owen Theatre, 170 N. Dearborn. A $350 ticket ($275 for members of the League of Chicago Theatres) includes access to presentations and networking opportunities with a who’s who of heavy-hitter producers and general managers from blockbuster shows in Chicago and on Broadway as well as national tours. Presenters scheduled for the conference include Tom Viertel, partner with Scorpio Entertainment (A Little Night Music); Allied Live Managing Partner Laura Matalon (Broadway’s Hair, Billy Elliot, Mama Mia and Legally Blonde, among others); Broadway in Chicago Vice President Eileen LaCario; Jujamcyn Theatres Creative Director Jack Viertel; Steppenwolf Theatre Executive Director David Hawkanson; David Richards of Richards/Climan (general managers for Broadway’s Blithe Spirit and All My Sons, among others) and Goodman Theatre Executive Director Roche Schulfer. Presenters are slated to address audience development, script and story development and promotional strategies and marketing techniques, among others topics. The conference is open to anyone interested in producing, co-producing or investing in the theater, be it in Chicago, New York or for national tours. Aspiring general managers and investors are also invited. Program planners say the weekend will be of special interest to anyone exploring relationships between the for-profit and not-for-profit sectors in the development of a theater project. The Commercial Theater Institute, now in its 29th year, is a project of Theatre Development Fund (TDF) and The Broadway League, Inc. Dedicated to training the next generation of commercial theatre producers, CTI strives to provide resources and guidance to people interested in creating commercial productions for the stage.